For more than three decades, Tom Monte has been a leading writer, teacher, and counselor within the natural healing community. As a national best-selling author, he has helped bring to the public’s attention the work of many cutting-edge doctors, medical researchers, and scientists. As a teacher and counselor in the use of natural healing methods, he has worked with thousands of individuals and families who were seeking to overcome serious illnesses or other life-altering crises. During the course of his work, he has witnessed and written about many “miraculous” recoveries. As inscrutable as these recoveries may have seemed, Tom began to recognize common factors among those who overcame serious illness. Based on medical research, the insightful work of others, his own work, and the experiences of patients who managed to reverse their own devastating health conditions, Tom has written an inspiring guide for those who suffer from chronic or life-threatening illness. Unexpected Recoveries is the culmination of a lifetime of work designed to offer hope, purpose, and—most important—a proactive plan. This book combines modern medical know-how, ancient healing practices, and a healing diet to provide a comprehensive and practical guidebook for physical, emotional, and spiritual recovery. It takes aim at such conditions as cancer, heart disease, kidney disease, chronic pain, Crohn’s disease, degenerative bone conditions, and more. Readers are provided with a seven-step program to help them on their journey of healing, with each and every step designed to be flexible. Factors such as mental attitude, lifestyle, diet, and exercise are discussed in an informative and easy-to-read manner. Along this journey, readers are introduced to twelve people who have recovered from incurable illness. Also included are a helpful resource section, a twenty-one-day menu planner, and over sixty kitchen-tested recipes. When a doctor tells a patient there is no cure, what the doctor is essentially saying is that there is no treatment proven to eliminate the condition. This doesn’t mean that healing isn’t possible. If you or a loved one is suffering from a severe illness, Unexpected Recoveries can be a powerful tool to change the course of that condition. "Especially commended to the attention of patients whose doctors told them there is no cure, no treatment proven to eliminate their particular condition . . . Unexpected Recoveries can be a powerful tool to change the course of their medical condition. Thoroughly 'reader friendly' in organization and presentation, Unexpected Recoveries is unreservedly recommended for community and academic library Health/Medicine collections. "—MBR Bookwatch - "Cowper's Bookshelf"
A national best-selling writer, counselor, and teacher of natural healing methods,Tom Monte is a leading voice in the natural health movement. He has written and co-authored more than thirty books and many hundreds of articles on virtually every area of health. Among his bestsellers are Recalled by Life, Living Well Naturally, and Natural Prozac. Tom has lectured and conducted transformational programs throughout the United States and around the world. His eight-month Healer’s Program, based in New York City and Orval, Belgium, trains practitioners in the useof highly effective natural methods for healing body, mind, and spirit. The Healer’s Program is also an experience in personal transformation. Tom also conducts workshops that focus on healing the heart and personal relationships.He lives with his wife, Toby, in Amherst, Massachusetts. People overcome the most devastating diseases. Choose any illness that is now considered incurable and with a little effort you will find someone who has accomplished the unexpected feat of defeating that disease. Over the past thirty-five years, I have written about many hundreds of people who conquered illnesses that had been diagnosed as life-threatening or even terminal by medical doctors. In most of these cases, conventional medicine had run out of answers. In others, doctors had urged their patients to adopt some form of experimental treatment that, in fact, offered little hope of recovery. Yet these people overcame their illnesses and restored themselves to good health. get past their fears and establish more compassionate relationships with themselves. take back their power, in large part by taking responsibility for decision-making in their own recoveries. adopt a healing diet composed largely of plant food. establish a strong support system that included loving relationships, social support groups, and healers. make a commitment to life and to their healing programs. develop faith, which can be strengthened through various forms of spiritual practice, especially through daily prayer and meditation. find a purpose for living that transcended mere survival. The intention of this book is to offer an action plan for the use of complementary healing methods, which can be used in conjunction with traditional medical treatment. Each of the seven characteristics described above are regarded as a step in the healing process. In the chapters that follow, each step is described in detail, and practical guidance is provided to show you how to incorporate each step into your life. The complementary modalities described in this book are all supported by medical and scientific literature, which is cited throughout the text, with references provided at the end of the book. These are not simply “alternative practices.” They are powerful healing tools whose degrees of effectiveness have been demonstrated both through human experience and in scientific studies. The seven steps detailed in the following pages form an integrated, holistic program. Every step is important--indeed essential--but the foundation of this healing program is a plant-based diet, as step three makes clear. There are many expert and well-known practitioners of plant-based diets today, and I have provided contact information for several of them in the Resources. (See page 217.) Rather than provide personal case histories for each of these different programs, I have chosen to illustrate the seven steps with stories of the macrobiotic diet and lifestyle or the Pritikin program in particular. These are two of the oldest, most widely adopted, and most closely studied approaches to healing found in the world today. Both beautifully demonstrate the powers of a plant-based diet to restore health, even in people considered extremely ill. And as you will see, the scientific support for adopting a plant-based diet— including in the treatment of serious illness—is overwhelming. The potency of these seven steps depends to a great extent on the spirit of the person using them. A sincere commitment to getting well is fundamental to the healing process, and no one step has as much power to heal as when all seven are followed. As with so many other experiences in life, this is another case in which the whole is greater than the sum of its parts. I have stressed throughout this book that people who use these methods should remain under the supervision of their doctors. As you incorporate the seven steps, your doctor can monitor you, inform you of any changes in your condition, and advise you in your medical choices. While it is important to remain in contact with your physician, it is essential that you explore other sources of information and become fully engaged in your own healing process. Only in this way may you fully utilize the healing powers within yourself, which, I am sure you will see, are far more powerful you think. • get past their fears and establish more compassionate relationships with themselves. • take back their power, in large part by taking responsibility for decision-making in their own recoveries. • adopt a healing diet composed largely of plant food. • establish a strong support system that included loving relationships, social support groups, and healers. 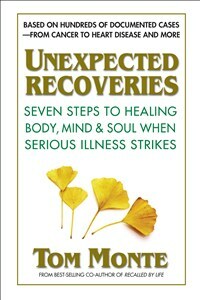 • make a commitment to life and to their healing programs. • develop faith, which can be strengthened through various forms of spiritual practice, especially through daily prayer and meditation. • find a purpose for living that transcended mere survival. The intention of this book is to offer an action plan for the use of complementary healing methods, which can be used in conjunction with traditional medical treatment. In the chapters that follow, each healing step is described in detail, and practical guidance is provided to show you how to incorporate each step into your life. The complementary modalities described in this book are supported by scientific literature, which is cited throughout the text. These are not simply “alternative practices.” They are powerful healing tools whose degrees of effectiveness have been demonstrated both through human experience and in scientific studies. The seven steps detailed in the following pages form an integrated, holistic program. Every step is important—indeed essential—but the foundation of this healing program is a plant-based diet, as step three makes clear. There are many expert and well-known practitioners of plant-based diets today, and I have provided contact information for several of them in the Resources. (See page 217.) Rather than provide personal case histories for each of these different programs, I have chosen to illustrate the seven steps with stories of the macrobiotic diet and lifestyle or the Pritikin program in particular. These are two of the oldest, most widely adopted, and most closely studied approaches to healing found in the world today. Both beautifully demonstrate the powers of a plant-based diet to restore health, even in people considered extremely ill. And as you will see, the scientific support for adopting a plant-based diet—including in the treatment of serious illness—is overwhelming. Suggestions for how to incorporate this seven-step program into your daily life are provided in the closing chapters of this book, while recipes and a weekly menu plan may be found in the Recipes section. (See page 181.) The potency of these seven steps depends to a great extent on the spirit of the person using them. A sincere commitment to getting well is fundamental to the healing process, and no one step has as much power to heal as when all seven are followed. As with so many other experiences in life, this is another case in which the whole is greater than the sum of its parts. I have stressed throughout this book that people who use these methods should remain under the supervision of their doctors. As you incorporate the seven steps, your doctor can monitor you, inform you of any changes in your condition, and advise you in your medical choices. While it is important to remain in contact with your physician, it is essential that you explore other sources of information and become fully engaged in your own healing process. Only in this way may you fully utilize the healing powers within yourself, which, I am sure you will see, are far more powerful you think. This book is the culmination of more than thirty years of writing about health and healing. Although it would be impossible to thank all the people who contributed to my understanding of these infinite mysteries, I would like to mention a handful of individuals. I would like to express my overflowing gratitude to my great mentors, Michio and Aveline Kushi, and Nathan and Ilene Pritikin, who gave me a foundation for understanding health and healing from both the Eastern and Western perspectives. Still under-appreciated, these four great teachers have provided countless millions of people with a path for better health and personal transformation. I would like to thank some of my friends and teachers who have contributed to my work over the years, including Luc DeCuyper, Denny Waxman, Michael Rossoff, Bill Tims, Robert Pritikin, Mary Burmeister, Herman and Cornelia Aihara, Wim Mestdagh, John McDougall, Michael Jacobson, and Anthony Sattilaro. My gratitude goes out to the many hundreds of people who have shared their stories of recovery with me over the past thirty-plus years, and the healers with whom I have worked. Not all of you appear in this book, but all of you contributed to it. My sincerest thanks go out to Ken and Sherry Courage, Peter and Maryla Wallace, and Phiya Kushi, who also supported this work. I would like to thank my wonderful friend and publisher, Rudy Shur; my editor, Michael Weatherhead; and the rest of the team at Square One Publishers for their tremendous talent, dedication, and commitment to releasing this book. Finally, I would like to thank my wife, Toby, who wrote the recipes and menus for this book, and who has acted as the foundation of health and happiness for me and our entire family for forty years. Each of us is plunged into his or her own private crisis whenever a loved one or dear friend is stricken with a serious illness. Driven by love, fear, and an overwhelming desire to help, caregivers will often spring into action, forgetting their own needs and limitations. Despite the best of intentions, a caregiver’s self-sacrifice can to lead to exhaustion, anger, and conflict—not to mention poor health. If you are a caregiver to someone who is ill, please consider adopting your own version of the seven steps described in this book. They can help you find rest so that you may have the strength to live more fully; care so that you can go on providing care; love so that you can go on loving; faith so that you can sustain hope; and strength of purpose so that you can find meaning in the challenges you are facing. Giving cannot be sustained without balance, meaning that those who give must also receive, and those who serve must also be served. Balance is the foundation of health and the consequence of love. Please consider participating with your loved one as he or she utilizes the seven steps to restore his or her health by adopting your own version of this healing program. The program can be yet another act of love—a gift you give to your loved one as well as to yourself.